Born in Southern Ireland (in the usual manner), I was raised in England, ran away to California in the early eighties, have lived in Florida and South Carolina and now reside in San Francisco. Chronologically, I fit in after the invention of the wheel, but before mini skirts (ooh!). I have entertained the public in various countries for the past 30 years. My shows are energetic, and I indulge my humorous nature by inviting audiences to participate with idle banter and sing-alongs. I truly get a charge out of audiences, and the more fun you have, the more fun I have! 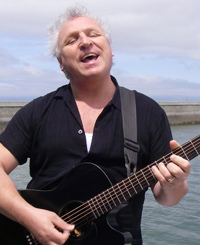 My music styles include: Pop, Irish/Celtic, Tropical Rhythms, Soft Romantic Ballads, Blues, and Rock & Roll. All infused with a healthy dosage of comic parody which I thoroughly enjoy. After a seven year sojourn in the Southeast, I have returned to the San Francisco Bay Area where I previously spent 18 years performing all over Northern California. Even further back, I did a lot of world travel performing. International booking include: Holland, England, Mexico, Germany, France, Ireland, Trinidad and Tobago, and Canada. I was chosen by Guinness to promote Harp Lager as the Northern California Entertainer (part of a successful National Promotion Campaign) as well as being hired by The Glenlivet Whisky Company as Brand Ambassador for the Tampa Bay Area (another successful campaign). I have recently been appointed the Captain Morgan Pirate for San Francisco. Other endeavours of mine include musical theatre, radio, TV, and Stand-Up Comedy. My three albums, available for purchase (here online if you wish) and at my gigs include: Latitude 38, an album of my own compositions. Love, Friendship and Loyalty, an album full of Irish favourites, and Songs I wish I'd Written, a popular cover-tunes album.